We'd love to get a small check in the mail. But we'd really love to have a stable education budget. This coming year, there's a way to give those school districts a little relief. It would take some political guts, but we call on Oregon lawmakers to make the tough call. The Legislature should suspend next year's income tax "kicker" refunds and use the money to reduce the pension debt saddling our public schools. For Oregon newcomers, the kicker "kicks" when the state brings in more income tax money than state economists predicted before each two-year budget cycle. If revenues come in just 2 percent or more above the economists' guess, all the added money is deemed a surplus and rebated to taxpayers. We've seen before what happens with rigid adherence to the kicker in the face of a crisis. In 2008, when the Great Recession forced waves of layoffs, foreclosures and public service cutbacks, more than $1 billion in state income tax revenues that could have eased the pain was rebated to taxpayers under Oregon's unique kicker system. That might seem like a lifeline to suffering people, but half the checks were for $113 or less, enough to buy a large cup of coffee at 7-Eleven each week. Let's not make the same mistake again with 2019 kicker checks, now projected at $724 million. The PERS crisis is gobbling up money that should be spent on teachers, textbooks and fixing defective water faucets. When people wonder how Oregon wound up with such a short school year, bulging classrooms and disappointing student performance, PERS is the elephant in the room, sucking up much of the funding. In the next school year, school districts must devote the equivalent of 28.9 percent of employee pay to PERS. In the Hillsboro School District, Chief Financial Officer Michelle Morrison says the district's pension payments will rise $35 million in the next two years. And PERS rates are being held artificially lower right now under the "collaring" system, and are projected to rise higher in future years. It's likely to get worse. State investments for PERS only earned 1.5 percent so far in 2018, so that's likely to drive up the PERS unfunded debt — now a whopping $22.3 billion. Don't look for the stock market to rescue PERS, with an economic downturn looming in the next year or two. This was a crisis rooted in a series of foolish decisions by state lawmakers, governors and PERS board members in the 1980s and 1990s. School districts bear no responsibility, and they have little wherewithal to raise enough money to solve it, due to voter-approved property tax limitations. Courts have made it abundantly clear that policy-makers can't slash pensions of those living on PERS checks, nor take away benefits already accrued by teachers and other public employees. As one GOP leader recently noted, it may be politically and legally possible to enact reforms that whittle down the PERS debt by, say, 10 percent. But most of it, we're stuck with. One way or another, taxpayers must pay for this colossal mismanagement of the state pension system. As lawmakers concluded when passing two bills in the early 2018 legislative session, one of the viable remedies is to use "found money" or windfalls to pay down the PERS debt. Comcast recently agreed to a $155 million lawsuit settlement, which will go to local governments. Cities could use that to pay down their PERS debts. But there's no bigger windfall than $724 million in kicker rebates, which could grow even larger. 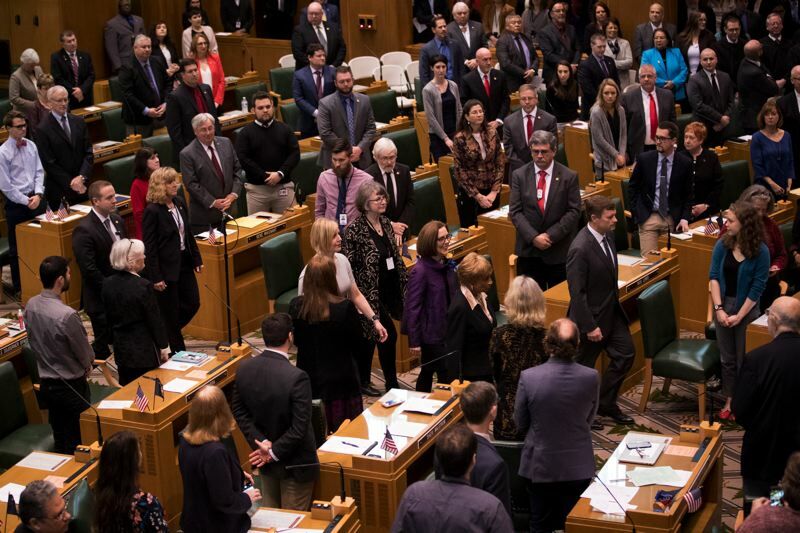 Some Democratic lawmakers will come to Salem next year buoyed by their new 60 percent supermajorities in both chambers, confident they can raise revenues without Republican votes. But any serious tax increases to aid schools can be referred to voters, and we know what happened the last time that occurred when Measure 97 went down in flames. Lawmakers who might argue to suspend the kicker rebates and put the money into school operations would be short-sighted. Hiring teachers with one-time proceeds is unwise when the money won't be there in future years to pay their salaries. Driving down the PERS debt for schools will lower their pension outlays starting in 2021, and for many years to come. School districts have an unfunded PERS liability of $4.8 billion if one deducts for "side accounts" — money many districts invested years ago to defray their PERS costs. Shaving that by $724 million from kicker money, and tossing in additional funds from other windfalls and one-time sources of revenue, would ease some of the pain. The Oregon Constitution provides for lawmakers to suspend the individual kicker rebates if there's a two-thirds vote in both chambers. It's only happened once, back in 1991, as it requires bipartisan support. Suspending the kicker rebates will be hard for Republicans who treasure them as a brake on government spending. But public schools are in crisis, and this is the prudent, fiscally conservative thing to do. And schools are more popular among GOP constituents than the state or local governments. Democrats have long positioned themselves as the champions of public schools. We ask them to prove it next session by helping schools clear out some of the mountains of pension debt that were imposed on them without their consent.